Salford City Council required an internal marketing campaign. The campaign’s aim was to deter dishonesty within the council. Rather than creating a negative ‘finger pointing’ or ‘bad apple’ campaign, Hive went for just the opposite. 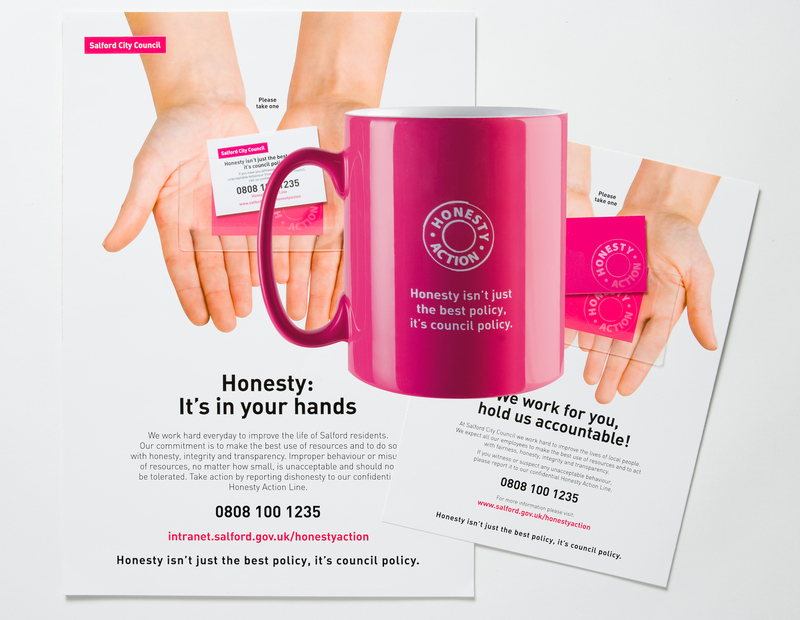 We developed a positive message that ‘honesty isn’t just the best policy, it’s council policy’. Putting the trust and responsibility into council employee’s hands. This began empowering them to act against dishonest behaviour and report it on and ‘Honesty Action Line’. Hive created posters holding handy contact cards for employees to take away featuring the hotline number. As well as producing mugs and coasters in the distinctive Salford Council hot pink, which could be used throughout the council to support the campaign, enabling the message to be quickly and effectively rolled out throughout the council.